With wine, a straightforward question can elicit contradictory answers. Clones are one of these minefields; winemakers are unlikely to agree, and the observer ends up more confused after the discussion than before! That said, the following text is an attempt to put the clonal resources of Australia into perspective. Most of the views about flavors and ratings are the author’s own, based on nearly 20 years of observations and in-house trials. I have tried to describe most of Australia’s clones, but this is not an exhaustive list. The early days of Chardonnay in Australia are somewhat fuzzy – depending on who you consult. It probably hit these shores in 1832 with James Busby’s famous importation and was planted on his family’s Kirkton vineyard in New South Wales, where via the Kaluna Vineyard in Sydney it even- tually made its way by the 1930s to Mudgee and the Craigmore vineyard. It was not until the late 1960s that the variety was identified as Chardonnay, and the first non-fortified wines were made. In 1970-1, Pieter Van Gent released a Craigmore wine that was labelled Chardonnay. In 1960, the Penfolds planted their Wybong Park vineyard in the Upper Hunter – later renamed Dalwood Estate. Among the varieties they planted was a White Pinot, which probably came from the Kirkton property via the original Dalwood vineyard in the Lower Hunter nearby (established by George Wyndham in 1830). In 1957, Houghton Winery in Western Australia imported the clone known as “Mendoza” or “Gin Gin” – although it’s not clear where it came from. It is also believed that in the 1860s Sir Samuel Davenport introduced Burgundy “chardenet” cuttings to South Australia. Some of these cuttings were planted at Marble Hill in the Adelaide Hills. The vines were rediscovered by viticulturist Wally Boehm when he was working for David Wynn; after cultivation at Wynn’s Modbury nursery, they were planted out at Mount Adam in 1972. Until a method of DNA testing is developed for grapevine clones, it looks unlikely that we will ever know how and if these early clones are related to each other. But it is clear that although the variety has been in the country since some of the earliest importations, it was not used to make varietal table wines until the late 1960s or early 70s. And it wasn’t before the 1980s that the production of Chardonnay was significant enough to make the national statistics. But when it finally did take off, it did so with a bang! 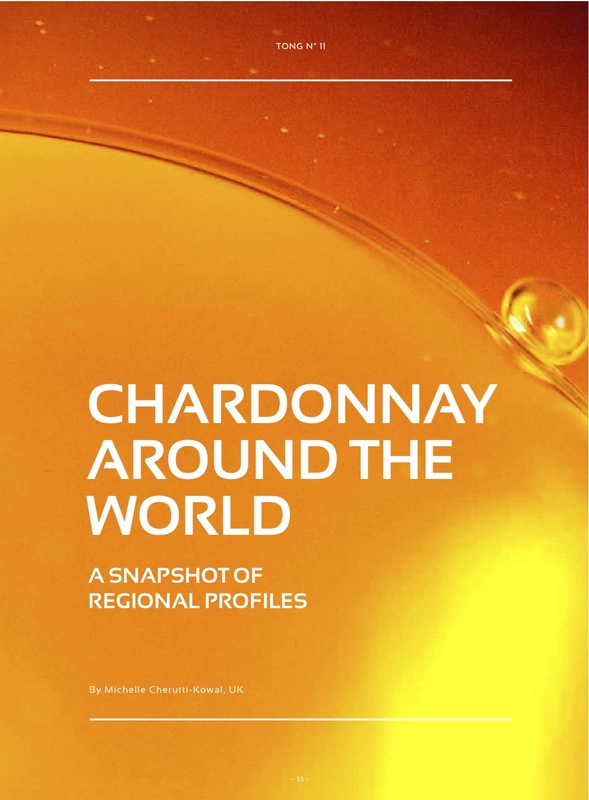 As the Australian industry boomed and started selling wines around the world, Chardonnay was a leading variety; in 2011, 404,610 tonnes were harvested in Australia, representing 25% of the total crush – the largest single variety. What Clones are planted in Australia now? [In Margaret River] most or all of which had been grown on vines representing the Gin Gin or Mendoza clone, which produces the best Chardonnay fruit in the region. Other clones which have been trialled are the Dijon or Bernard clones 95, 96, 76, 277, which are higher yielding and appreciated for adding freshness and softness to the wine. Clones, called 1, 3 and 5, are planted in small quantities, but are not considered to be of high quality, and Penfolds 58 is also planted but not widely used. The Gin Gin clone or Mendoza exhibits nearly 100% millerandage, providing a high skin to juice ratio and thus a good depth and concentration of flavor. The fact that it generally yields less than 5 tonnes per hectare helps account for the great depth and concentration of fruit that characterizes the Chardonnays produced in Margaret River. All vines are planted on their own roots. The fruit flavors of Chardonnay in the north of Margaret River have citrus, nectarine, white peach and grapefruit characteristics. In contrast, the Chardonnays from the southern part of the Margaret River region, of which that of Leeuwin Estate is a particularly good example, have highly distinctive and dried pear, grapefruit and stone fruit characters. The Penfolds 58 clone – likely to have been sourced from the Penfolds Wybong Park vineyard – has a following, although it doesn’t seem to have been planted much since the introduction of the Bernard clones. It also can show significant hen and chicken in bunches, leading to concentrated flavours and textures. Wines made solely from this clone are finely structured but with concentrated flavours and long palate. In the 1980s and after, winemakers started importing the clones known collectively as the Burgundian, Dijon or Bernard clones. To read the rest of the article, please subscribe to TONG. Louisa Rose is the chief winemaker at Yalumba, Australia’s oldest family-owned winery. She has completed 20 vintages at Yalumba, based in the Eden Valley (Baros- sa) and has worked with the development of a number of varieties and wine styles including Chardonnay. 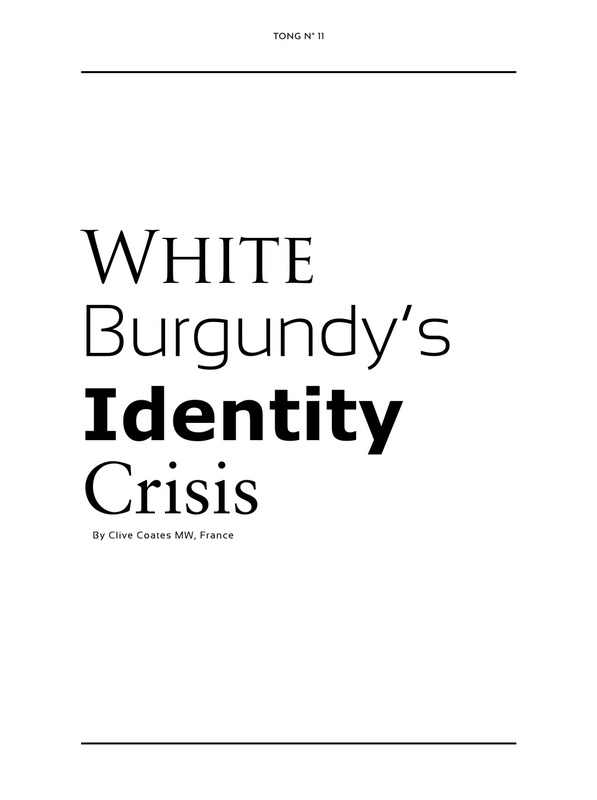 When Filip Verheyden asked me to write about white Burgundy’s identity crisis, my first reaction was to ask myself if the thesis was right. Yes, there are problems, but not so different from many wine regions. Demand in the West has dropped and in the East the market is still largely confined to top Bordeaux. Prices have risen, especially for those paying in US Dollars and Pounds Sterling. Many collectors already have full cellars because they bought more than they consumed. There is the residual effect of prematurely oxidised bottles, which Arne Ronold MW covers elsewhere in these pages. And it is clear that standards in the Côte d’Or and Chablis – I exempt the Mâconnais – could be improved. But “crisis” is putting it too strongly. The growers and brokers I spoke to did not seem unduly alarmed. The top domains still have no difficulty selling their products. I asked around. Jasper Morris MW puts it more bluntly. A senior buyer for Berry Brothers and Rudd, and author of the excellent “Inside Burgundy”, he says: “If white Burgundy is not in crisis then it certainly deserves to be. Those who used to buy white Burgundy for laying down have stopped, not only because there are less of these sort of white wines but because of fears of premature oxidation.” And because we still don’t seem to know why this problem arose, it is difficult to be sure that it won’t recur. Yet more recent buyers on the market are to some extent taking up the slack by drinking the bottles earlier. Prices in real terms ex cellars, Jasper points out, have remained stable over the last 10 years. It is when you consider the progress with red wines over the last decade or so that the lack of improvement and consistency among whites is disappointing and even alarming. So there may be no storm at the barricades demanding every last drop of Meursault as soon as it is in bottle, but the bottom cannot be said to have dropped out of the market. The old rule remains. Make good wine and you will have no difficulty selling it. And make wine that is only average, or worse, and your cellar will remain full. In many ways, white Burgundy is a unique wine. With the exception of a few dry Rieslings from Alsace and the Wachau in Austria it is the only dry – and therefore food-friendly – wine that at its top levels is better from five to 10 years after the vintage than before. I stress “top levels”. Consumers sometimes commit the error of assuming that all Burgundian Chardonnay can, indeed should, be cellared this long. The fact is that all Chablis with the exception of first division Grands Crus (Raveneau, Dauvissat and their peers) and from a fine vintage needs consuming sooner. The same goes for Côte Chalonnaise and the Mâconnais. I am enjoying Jacqueson’s Rully, La Pucelle, and Saumaize’s Pouilly-Fuissé from Vergisson, both 2008 (the 2009s are richer but softer) right this minute. The same would apply to all but the best Côte d’Or whites. Dominique Lafon told me of a recent experience. He was in a bistro in Beaune and noticed two men sending back a bottle of his Meursault. The words “prematurely oxidised” rang around the restaurant. He called the waiter over. The bottle was his basic Meursault 2004. Not a brilliant vintage, and now showing a little age, but perfectly acceptable if you’re looking for a full-matured white Burgundy. But prematurely oxidised? Absolutely not. “Messieurs,” said Dominique, “This 2004 is exactly as I would have expected it to be after all this time. This is what a fully mature Meursault tastes like. It is not “prematurely oxidised”. However, it is obviously not to your taste, so please accept a bottle of my Clos de la Barre 2008 with my compliments. However, should more white Burgundies be able to hold up beyond their fifth birthday? Those that do are certainly much the more interesting and rewarding. And there is an ocean full of Chardonnay from around the world, much of which is more than decent (if tending to be overoaked) for those producers and consumers who can’t wait that long. It is difficult to be absolutely certain, but I suspect that more bottles of first-growth Puligny-Montrachet and others made better 10-year-old bottles in the old days than now. If this is true, and I have notes from the days when I was newly hatched in the business about 1959s and earlier vintages enjoyed 10- to-15 years after bottling, then this is a subject that needs to be addressed. However, it is easier to explain why this has happened than to be confident that the demand is there for the trend to be reversed. Over the last generation or so, if “revolution” is putting it a bit strongly, there have been some major changes, many for the good, some for the bad, in the way white Burgundy is produced. The changes in the vineyard have been largely highly positive: the rise of biodynamism, the reintroduction of the plough, the fall in the use of herbicides and pesticides, the move towards the use of predators and techniques such as sexual confusion to reduce insect damage, the change from spraying by rote to the reactive lutte raisonnée, the limitation of the crop, the exclusion at the top levels of the picking machine, and so on. In the cellar itself much that is in vogue at present is for the better: sorting machines, bottling after 18 months rather than 12, and the overall reduction of racking and other manipulations. Not to mention the general improvement in overall cleanliness. Throughout Burgundy, as elsewhere, winemakers are interfering less than before. It has become a cliché, but it sounded new the first time I heard it from René Lafon’s lips 30 years ago. “Il faut avoir le courage de faire rien” (“One must have the courage to do nothing”). It is when you consider the progress with red wines over the last decade or so that the lack of improvement and consistency among whites is disappointing and even alarming. Subscribe to TONG to read the rest of the article. TONG is based in Belgium, at the heart of Europe. The word is Flemish for “tongue”. Clive Coates MW is a world expert on Burgundy. He lives in the region and knows practically all the growers there. In 2008, he revised his seminal “Côte d’Or: A Celebration of the Great Wines of Burgundy” under the new title “The Wines of Burgundy“. It is still considered the “Bible of Burgundy”. Coates published his fine wine magazine “The Vine” from 1984 to 2005. His website www.clive-coates.com features news from Burgundy, vintage reports and the results of comprehensive tastings. Access is free. Over the past 10 years or so, wine lovers have had to add a new word to their vocabulary: “premox”, or “premature oxidation”. The premox problem has affected white wines in Burgundy to such an extent that many consumers now look to other regions for high-quality age-worthy white wines. Cork quality and vinification techniques have been blamed, but more thorough investigation has shown only one reasonable explanation: a lack of sulphur dioxide (SO2). It all started with the 1996 vintage. In retrospect, some wines from the 1995 vintage were already affected, but it was in 1996 that the extent of the problem became apparent. That year was characterized by a long and slow ripening period with sunny weather and a cool north- to north-easterly wind, and cold nights, producing perfectly ripe grapes with very high acidity. Acidity levels of around 8 grams per litre and pH values of 3 were common, and because of this many producers had trouble with malolactic fermentation, meaning that many wines were bottled later than usual. But the quality of most of the wines was considered outstanding, and because of the acidity levels, they were thought suitable for very long ageing. Tasting the wines just after bottling, and also a year later or even two to three years later, confirmed this assessment. But then, after three to four years in bottle, the situation changed. Many of the wines showed huge bottle variation and there were an alarmingly high number of prematurely oxidised bottles, which appeared to be distributed randomly among wines and producers. With time, the number of these oxidised bottles increased. A similar pattern was detected in other vintages originally considered ageworthy, such as 1999, 2002 and 2004. The problem can be described as follows: white Burgundies from what are considered good to great vintages appear as they should in cask, promising and apparently age-worthy. They show similar properties just after bottling as well as a couple of years later. But then, after several years in bottle, a high proportion of the wines appear to oxidise prematurely, a problem that seems to accelerate with time. What is causing this and why did the problem appear only from the mid-1990s onwards? Older vintages, such as 1993, do not appear to be affected. 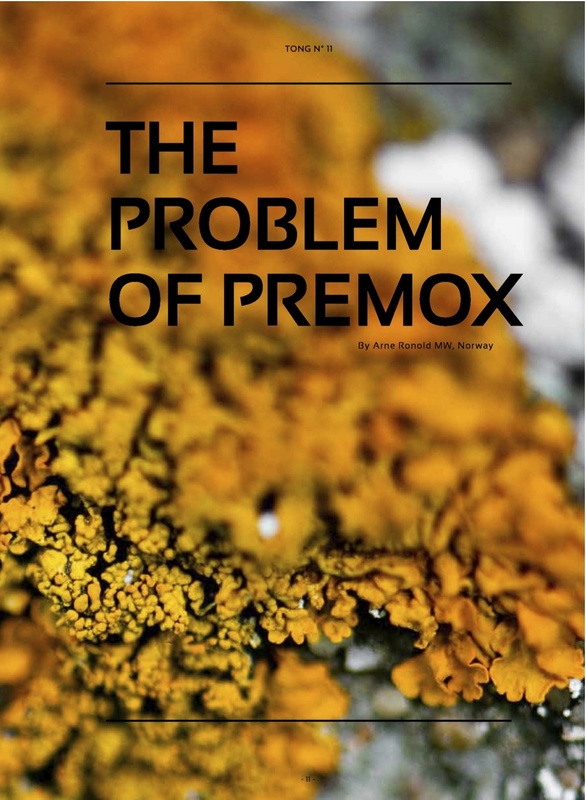 Premox has been the object of much attention over the past 10 years, in wine publications as well as on internet discussion forums, such as oxidised-burgs.wikispaces and dat.erobertparker.com. In Burgundy, the Bureau Interprofessionel des Vins de Bourgogne (BIVB) has made significant investments into research in this area. There are a number of theories; many point to the corks as the most likely cause for premox, as this would explain the random nature of the problem. Many claim that cork quality has decreased significantly since the mid-1990s, mainly due to increasing demands from the wine industry. Others suggest that new bleaching material used for the corks – from chlorine-based products to hydrogen peroxide, a strong oxidant – may leave traces of peroxide residues that could cause premature oxidation. Yet others suggest that it is the new cork-coating material paraffin coating rather than silicon-based material – which facilitates the intrusion of oxygen into the bottles and thus triggers the premox process. However, according to the Enology Department at Forschungsanstalt Geisenheim, Germany, corks are not to be blamed. “At Geisenheim, we have run trials and comparative studies over the last 20 years that eliminate the cork as the problematic factor in this problem.” If premox was caused by poor-quality corks or any particular treatment then oxidation would appear almost immediately after bottling and not several years later. Many observers claim that the problem is due to vinification issues such as the improper use of SO2 during vinification or the extensive use of bâtonnage. In 1996 in particular many of the wines were aged extensively on the lees due to delayed malolactic fermentation, and many producers did extensive bâtonnage due to the clean fruit and high acidity of the wines. But again, if this were the cause, you would expect the oxidation to occur much more rapidly. Others believe that the new wine presses contribute to the oxidation process. The older basket presses would allow some exposure of the must to oxygen. When pressing the grapes, phenolic compounds would oxidise and settle and the remaining must – and the resulting wine – would be less prone to oxidation. Today most producers use pneumatic presses, which operate in a more reductive atmosphere and yield a very clean juice and a wine that could be more prone to oxidation. But I don’t believe the type of press makes any significant difference, as long as the wines are protected by high-enough levels of free SO2. The wines are likely to oxidise if there is not enough SO2. We are left with only one logical cause for the premox in white Burgundies: too-low levels of SO2. Or more precisely: too-low levels of free SO2 at the time of bottling. SO2 has several useful and protective qualities in winemaking, among them its antioxidative properties. It exists in different forms in wine and it is common to speak about “bound” SO2 and “free” SO2, which together constitute the “total” level of SO2. It is the free SO2 that has the antioxidative properties. SO2 can be used at several stages during vinification, but It is particularly important to ensure that free SO2 at the time of bottling is at a satisfactory level if the wine is destined for a long maturation period in bottle. Just after bottling, the level of free SO2 will decline, initially quite significantly, later more gradually. If there is not enough free SO2 at the start, then the level will become insignificant at some stage during bottle maturation and the wine will grow prone to oxidation. 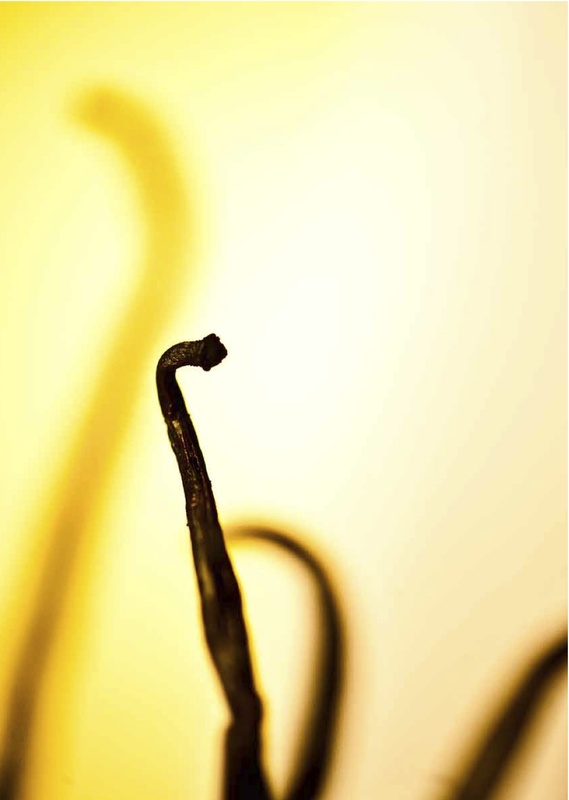 Wines contain enough free SO2 to protect them for some years, but not enough for the entire desired maturation period. That is most probably the cause for premox in white Burgundy wines. Arne Ronold is founding editor of the Norwegian wine magazine Vinforum (since 1986) and was the first Master of Wine (1993) from the Nordic countries. He is responsible for running the Wine & Spirit Education Trust courses in Norway and lectures regularly on wine in many other European countries. Arne is also the author of numerous books about wine and is considered an expert on wines from Austria, Burgundy, Germany and Italy. TONG is a magazine about wine. 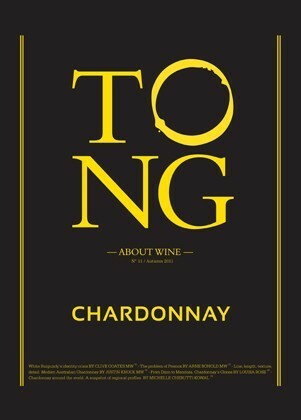 The current issue of TONG is on Chardonnay. Filip, the editor and publisher, was kind enough to allow excerpts to be included with this project. Subscriptions are only available through their website. Please read their Manifesto for in-depth insight into the philosophy behind production. Chardonnay has always been under attack, especially in Europe, for reasons familiar to many wine lovers. Some call it “winemaking’s whore” and its many styles and the grape variety’s exceptional adaptability to different – and sometimes even opposite –climatic conditions have led to a fuzzy, ill-defined image. Upscale consumers in particular have little time for Chardonnay. They see Burgundy as the epitome of high-quality Chardonnay, while “cheaper” overtly oaked styles with tropical fruit character – mostly from the New World – are the preferred tipple of so-called “entry-level” wine drinkers. But the traditional image no longer holds true, as you will read in this issue. Australian Chardonnay is finding its way back on stage with lean, mineral Chablis-like wines from lesser-known cool climates like Orange and Tumbarumba. These wines are slowly earning a reputation in Europe, mainly due to the new worldwide preference for more refined and clear wine styles.Sauvignon Blanc and to a lesser extent Riesling have clearly paved the path for modern Chardonnay. Big New World producers like Yellow Tail have changed their packaging from white bottles and luscious golden labels to green bottles and plainer labels in which green predominates. 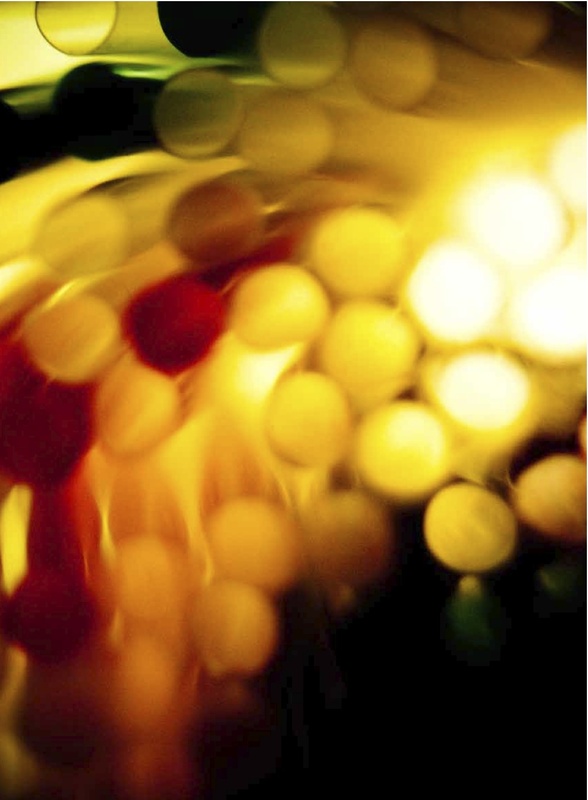 This issue is short of one article – the role played by Chardonnay in Champagne. We looked for in-depth information on the subject, and were disappointed by the lack of knowledge among winegrowers and winemakers, especially the big producers. Maybe they want to keep it secret. In Champagne’s vineyards Chardonnay tends to be easier to grow than Pinot Noir. It is less susceptible to Botrytis, ripens more easily and has a higher yield. Chardonnay contains more alcohol than Pinot Noir and is less susceptible to oxidation, but the grape variety tends to be treated like Pinot Noir and Pinot Meunier. The reason the Côte des Blancs is known to produce more mineralic and refined Chardonnay than elsewhere in Champagne is due to more south-facing slopes and the soil’s higher lime content that buffers the acidity in the wines. We would love to see some scientific research in this area. To conclude, we wanted to make this issue on Chardonnay because we firmly believe the grape variety is making a rapid comeback. But it is no longer in Burgundy that the most interesting Chardonnays are produced these days. Australia rules, and we have tasted some very good trials in Chile too. 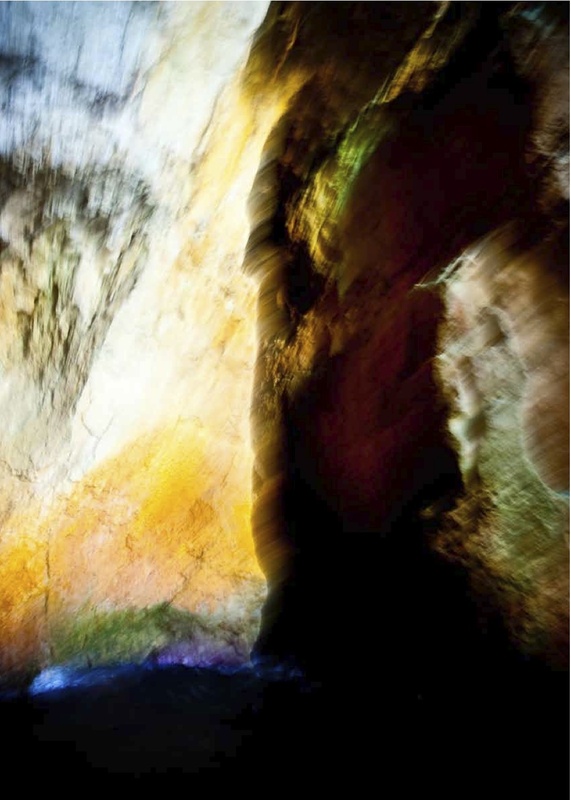 Over the next few days, you’ll see [not so brief] excerpts from the current issue, written by the likes of Clive Coats MW, Arne Ronold MW, Luisa Rose and Michelle Cherutti-Kowal. They will touch on topics such as the identity crisis of White Burgundy, the problem of premox, snapshots of regional profiles and a examination of Chardonnay clones. TONG is a wonderful publication, I encourage anyone serious about wine to look into subscribing. It is more than worth the investment.